I always wanted a "safari" themed nursery but knowing we wanted to be surprised on the gender of our baby, I had a feeling it would be difficult to decorate a neutral style nursery without the ultra bold colors. And then I found the perfect bedding set! The Sleepy Safari bedding set was the foundation of the colors and theme direction we chose. Ivories, sage green, light tan was what I wanted so that once Baby made its debut, we could easily add pinks and blues in certain areas. The Sleepy Safari line is a Nature's Purest product. I used to work for an architecture firm that had an in-house interior designer (also a new mom) so I utilized her expertise in choosing the colors for our nursery. We built a chair rail (well, hubby did) and chose a neutral ivory with khaki stripe (country style) vinyl wallpaper for the bottom half and a sage green color was selected for the top half. The sage green color was a match to the green in our bedding line. We used Mythic Paint, Earth Friendly, Low Odor, Zero VOC paint. 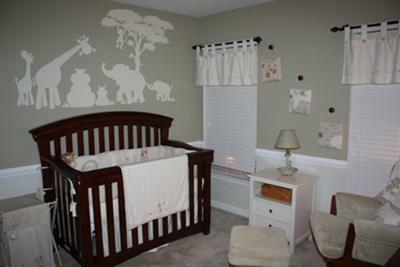 I wanted to create a focal point for the space above the crib and after much searching, I landed on a website www.elephantsonthewall.com to find just the silhouette mural I was looking for! This cartoonish safari themed mural includes a complete pattern with carbon paper on the back for tracing on the wall. We did not use the entire pattern because of size and personal preference, which was the best part about having the stencil. We chose to go with only one tree instead of both and did not paint two lions that were included because of size. This is by far our favorite part of the nursery! We chose the ivory color matching the wallpaper for the mural. It took 2 coats of paint to do, no primer. And we only used a 4 oz sample of paint which was plenty, cost us $2.50!! We purchased the Westwood Designs Stratton Model crib set for our nursery. We originally thought of purchasing a dresser and crib only but decided to add the additional hutch (not shown in picture). This hutch has a touch light in three variations of brightness which will be helpful at night when changing the baby. The crib is a convertible crib that will convert into a toddler bed and single bed. set is the bedding set we chose. The Sleepy Safari bedding is organic cotton and oh so soft. And one of the selling points for me was that it came with many many accessories to pick and choose from! As for window treatments, we received Sleepy Safari window valances as a shower gift. I plan on asking my mother-in-law to help make some pinkish or bluish color curtains after the baby is born. Until then, we have white blinds in the windows. In addition to the touch light on the hutch, we purchased a floor lamp with a neutral shade that I will end up swapping out with a blue or pink lampshade once the baby is born. Pottery Barn Kids and Anthropologie have some adorable pink/blue lampshades. We also have a neutral mini lamp for nighttime feedings that I found at a country antique store last year. There are 3 wall hangings that match our bedding and we plan on swapping out the knobs for pink or blue eventually. On the opposite wall (not shown) is a nursery organizer, another Sleepy Safari accessory, to use for various storage, etc. We stored our baby goodies inside the baby's closet, we purchased more shelving and drawers from Target along with various baskets in different sizes for bath goodies, socks, shoes, baby carriers, and other accessories. Our nursery came together slowly, but all in all, it took about 6 weeks from our furniture delivery to adding accessories and painting the mural. The mural itself took both of us 5 hours, which was long for me to be standing on my feet 8 months pregnant! But it was fun and we enjoyed it as we listened to music, took pictures, and videotaped the progress. At first, this was difficult holding a steady hand, but we got the hang of it after a bit. I was worried the paint fumes would be too much for me but it was so minimal, I was happy I could help out (minus the feet swelling part). My husband, J.C. applied the wallpaper, chair rail, and paint. I love the mural the most in our baby's nursery because it adds some fun to the room! Mama and Baby elephant, giraffe, and hippos are too darn cute. I look forward to our baby's arrival so we can add some pink and blue accents to it! I love the stencil you used but it is a bit pricey to purchase new. Do you have any interest in selling yours? I love how this looks! Where did you find the knobs that you used to hang the 3-piece wall art??? THANKS! Where did you get the wall mural from? I assume it is a wall decal. I love it and want it for my baby's nursery!! My husband and I are expecting our first baby in June 2011. 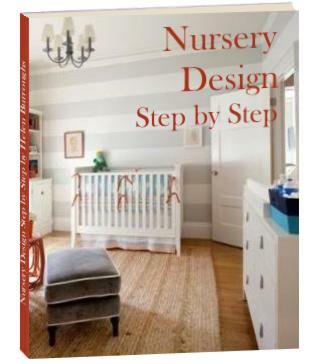 I came upon this website to get some ideas for the baby nursery. I found the perfect theme from your second baby room contest. It was labeled Sleepy Safari Nursery. It was sent in from Laura from Chester Springs PA. I love the colors of the room. Would it be possible to find out exactly what color paint she used from Mythic Paint? I love the way the room looks!!! It would be greatly appreciated if anyone can let me know. Thank you. I love the gorgeous animals and what a wonderful neutral color scheme. It will look fantastic with some pink or blue accents!